Hand Made Sterling Silver Cuff Bracelet, "Precious She-Elephant"
Jasmine blooms in gleaming profusion, covering a wide cuff bracelet. Frolicking amid the flowers, a little female elephant is a symbol of old Siam. Achara presents this exquisite design, handcrafted in sterling silver. You can find sterling silver cuff bracelet 'Precious She-Elephant' by Achara in jewelry categories such as Animal Themed Bracelets, No Stone Bracelets, Sterling Silver Bracelets and Cuff Bracelets. Enjoy exploring these sections for other Novica treasures. 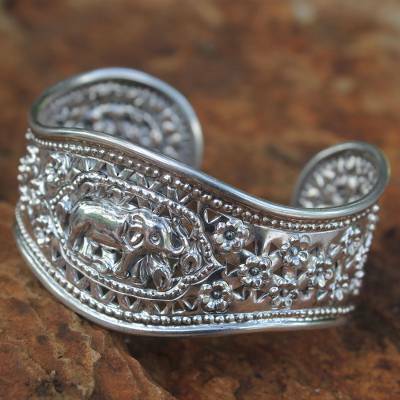 A beautifully made silver cuff depicting a pretty little female elephant in a natural peaceful setting. The cuff can be adjusted somewhat to fit most comfortably. Achara's impeccable taste and talent is obvious in all her designs.